Throughout history, the wedding band has been among the most meaningful pieces of jewelry a woman could own because it symbolizes lifelong commitment and true love and even today, wedding rings carry just as much weight. More recently, wedding rings have also become a way to express unique personal style through traditional pieces of jewelry. In response, jewelry designers are introducing countless new styles to meet the growing demand for one-of-a-kind pieces. Over the past 30 years, Dominion Jewelers has had the honor of playing a role in love stories and “happily-ever-afters.” Since 1985, we have welcomed countless couples into our boutique and helped them choose or design rings that poignantly capture their love in the form of jewelry. For the past few decades, we have seen the ebb and flow of trends as styles shift over time and know that today’s most popular wedding ring styles are an exciting mix of modern and traditional; they are designs that mark the shift from cursory to extraordinary that Dominion Jewelers is so well known for producing. Our custom women’s wedding bands have seen a major increase in popularity as more people seek to create something that perfectly fits their style. We can bring a dream wedding ring to life whether this means incorporating a family heirloom, combining several inspiration images into one final product, or simply creating something they have been dreaming about for years. Pave-Set Diamonds: A pave set band is a stunning way to maximize the sparkle of your ring while still complimenting a variety of ring styles and large stone shapes. Eternity Bands: The eternity band is an endless circle of diamonds, guaranteeing an elegant shine from every angle. 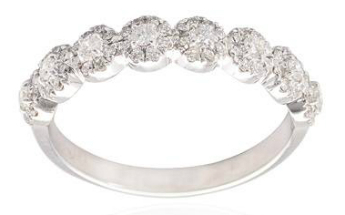 The eternity band symbolizes the idea that great loves have no beginning and no end. Stacked Bands: Many are opting for a solitaire engagement ring so it can be complemented over the years with two or more stacked bands in varying styles, such as a simple thing gold band, a skinny shared-prong sapphire band, a rose gold pave set band, etc. This option offers versatility and an opportunity to mark special life events with a new skinny, stackable ring. Diamond Cuts: Combining different diamond cuts in a classic ring setting is an excellent way to create something both unique and tasteful. For example, Asscher-cut diamonds in a conventional band are elegant and eye-catching, due to the juxtaposition of the non-traditional shaped stone in the traditional ring setting. Contact Dominion Jewelers and let us help you find or create the wedding band you have always wanted. Whether you choose a designer creation or to custom-make something of your own, your wedding band should be something you absolutely love and treasure forever.